I honestly thought I've seen everything that's been made surrounding George Lucas' classic Stars Wars film. Then something like this documentary comes along and surprises the hell out of me. I'm not sure how I never saw this in my lifetime until now, but that's how it all worked out. 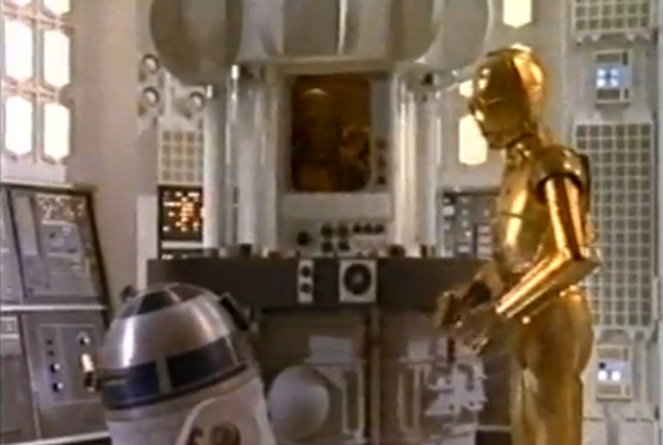 This Making of Star Wars documentary was made back in 1977 (before I was born) and it was hosted by C3PO and R2D2. This is very interesting and fun hour-long documentary that is a must see by anyone that's a fan of Star Wars. If some things look familiar to you while watching the doc, it's because there are bits and pieces of this documentary that have been included in other documentaries that we've seen over the years. Ever wonder how they ever managed to make a movie like Star Wars? Well, bickering droid duo C-3PO and R2-D2 host this tour of the mind of creator George Lucas and what inspired him to make the movie. Even interviewed are the cast and crew, even features scenes of when C-3PO, R2-D2, and Darth Vader planted their footprints (or in R2′s case, tread-prints) into cement. Also discussed is Star Wars mania, how fans loved the movie, collected the merchandise and danced the disco music. Also shown are behind-the-scenes looks at the movie, as well as how difficult each effect was in doing since they didn’t have the convenience of computer animation back then. I found the doc very entertaining. It's been broken down into four videos and embed for you below. Watch them below and tell us what you think! I hope you enjoy it!